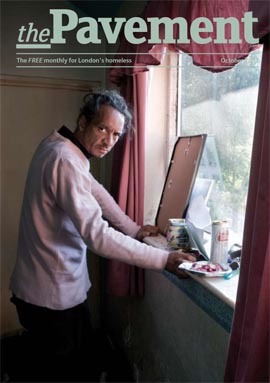 (The Pavement, 6 October 2011) Following the rescue of 24 “slaves” from a traveller’s site in Bedfordshire, it has emerged homeless people are being abused as slave labour. Following the raid at Greenacre caravan site in Leighton Buzzard, four men and one woman were arrested using new legislation under the Slavery and Servitude Act 2010. The men – James Connor, 23, Tommy Connor, 26, Patrick Connor, 19 and James Connor, 33 – appeared at Luton Magistrates Court and have been remanded in custody to appear at Luton Crown Court on the provisional date of 5 December 2011. The fifth defendant, Josie Connors, 30, was charged with two counts of conspiracy to commit offences of holding people in servitude, plus two counts of requiring people to perform forced labour, appeared in court on 22 September. Croydon Council also stepped in to help, collating the information to pass to the police, while the soup run’s volunteers began issuing leaflets in English and Polish. “Even if the clients themselves aren’t particularly concerned,” said Mr Adams, “the gang leaders are savvy and they know that we’re on to them.” Since then the Croydon Nightwatch hasn’t seen any more such recruiters.